I am blessed to have discovered bikram yoga back in 2006. Although I didn’t maintain a regular practice until 2011, I knew I was going to love it after that first class. Now I practice 6 times a week (ish) and don’t think twice about going. I don’t have to make myself go like I did to get myself to the gym. I love going. Bikram yoga is my thing. 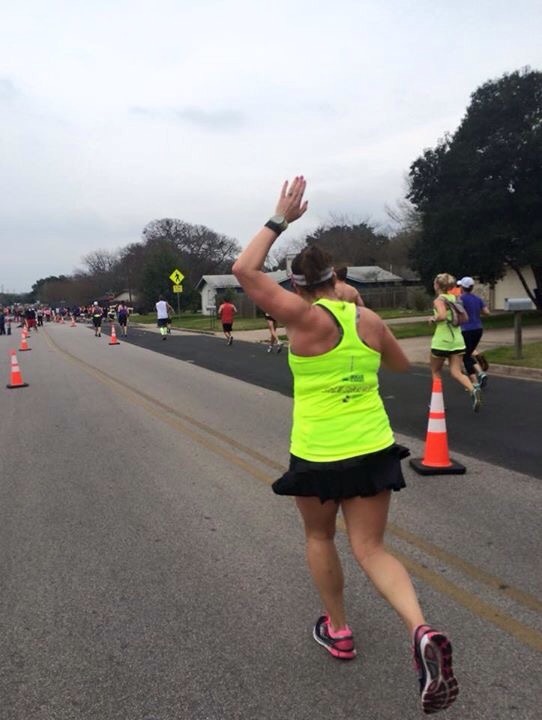 Last weekend my friend D and I cheered on another friend who was running her 6th marathon. Yes, 6th marathon. We stood out by the 17th cheering on runners. Some looked happy but some looked like they were dying. Exhausted and running out of energy. D and I did our best to cheer on everyone with encouragement and positivity. Our friend ran by and she was having a ball. She was running with some friends and they were chatting and dancing around. She even ran this week after the marathon (even with badass blisters). Running is so definitely her thing. My friend D does crossfit. She cycles a little but she does crossfit 4 times a week. 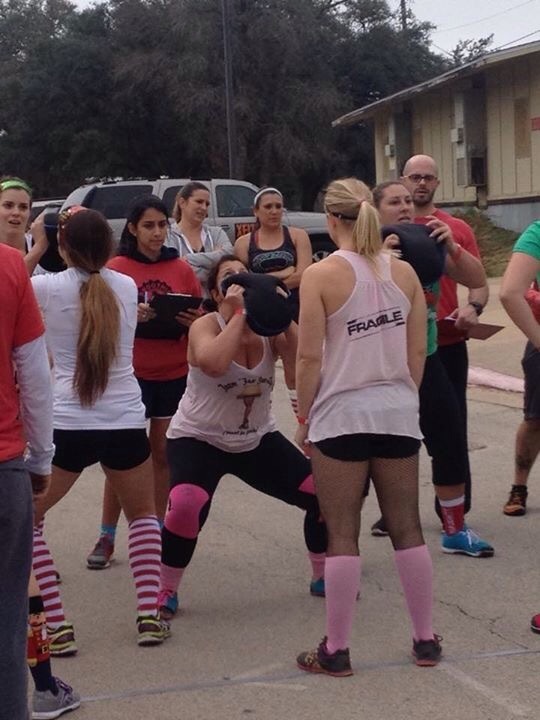 Snatches and double unders and the kettle bells. She loves it. She was in a competition before Christmas. It involved 4 WODS (workout of the day). Yes- 4 workouts in one day. It was so intense! It requires so much strength and stamina. It is so her thing. The three of us are so lucky! We have found our things. They’re all different. But we all cheer each other on in our thing. It’s so fun to watch my people doing their things! PS: I couldn’t imagine being a runner or a crossfitter after watching these wonderful ladies in their elements. Here is an old pic from my yoga competition with my amazing fans! Newbies and regulars- love them all! I love this busy time of year at my studio. It’s challenge season so there’s lots of us regulars in the challenge going to class everyday. It’s also the start of the year which brings New Years resolutioners who may have never practiced before. I love practicing next to experienced yogis. They are very calculated in their motions and are so dedicated to their practice it motivates me to do my best. I love practicing next to new people too. They’re just figuring out how to listen to the dialog and how to get into postures. They’re fresh and don’t have those “bad habits” yet. If it’s their first time they’re watching people around them to see what to do. It makes me want to be on my best behavior too. They should have a clear example to follow without all those habits we have (wiping sweat, always drinking before triangle, fixing our towels before balancing stick). I finished class 49 yesterday- 11 more to go. So far the only ‘injury’ I have going on is my ribs. I think it’s from the yoga workshop (aka 36 hours of yoga in 5 days). We did a lot of backbending and I think my ribs/intercostals are jacked up. Nothing too terrible. In fact it keeps moving around (my teacher says that’s good- better than staying in one place). Right shoulder to left side of my ribs to right lower back to right side of my ribs. Sure I could go see someone about it but it’s just not too bad. Not as bad as my McRib a couple years ago (yes, it started during a challenge). This year’s 60 day challenge hasn’t been too insane because I haven’t gone out of town. I haven’t gotten sick (yet- knock on wood) and I got quite a bit ahead with the workshop last month. I’m having fun with my regulars and my newbies! Everlasting yoga brain? What’s going on! I’ve been in a funky haze the past few days. Serious yoga brain nonstop. That fuzz you feel after yoga class. You can’t really think straight and it takes longer than it should to make simple decisions. Yoga brain. For days. You should have seen me teach thermochemistry to my classes Friday! Good thing my students are so sweet and patient. I just finished class 43 today. It’s that point in a challenge that’s a dull valley. I’m over halfway done but not close to finished. Just stuck. Maybe that’s why my brain is fogged? I’ve had an emotional week. Family drama. Everyones ok and all, it was just emotional. Maybe that’s why I seemed dazed over? Gotta get out of my brain fog! !